Bundesliga | Borussia Dortmund's Julian Weigl: "Nuri Sahin and I are pieces of a jigsaw"
Borussia Dortmund's Julian Weigl: "Nuri Sahin and I are pieces of a jigsaw"
After four long months on the sidelines with a broken ankle, Borussia Dortmund's midfield metronome Julian Weigl finally made his return to the BVB first-team on Sunday, helping Peter Bosz's men to a 5-0 win over Cologne - a result which sent the club top of the Bundesliga. Question: Julian Weigl, how did it feel stepping back onto the pitch after four months out injured? Julian Weigl: Like a dream! I couldn't have imagined it going much better. The guys had already done a bit of work up to my substitution. It wasn't a game on a knife edge so it was a little easier to come back into the team. It was great fun. The hard work in rehab has paid off. Question: It was the first serious injury of your career. How did you feel when you were out? Weigl: It was really something new for me. And there were difficult times: those moments when you just can't seem to get ahead; when the guys go out to play and you're stuck in the gym. It drags you down a bit. But I'm generally a positive person and I've always tried to look on the bright side of things. Still, there were days when I didn't want to see anyone and just wanted to go home. But I got running again, touching the ball. You just have to take progress as it comes. Question: Your status in the Dortmund squad is also quite unusual for you. Before your injury you were an undisputed starter. Now Nuri Sahin is providing stiff competition in your position. How do you deal with that? Weigl: I'm not thinking about that at the moment. Right now I'm just glad to be back in the squad. Nuri has done really well so far. We also have a lot of games ahead so it's important we can both push the team forward. We're not in fierce competition with each other. We understand each other very well. I'm happy for him that he's been able to get back on track after injury difficulties of his own. We'll see how the coach deals with it in the future and who is preferred. Perhaps it will be affected by whom our opponents are, since we're just pieces of a jigsaw. For me it's just important that I'm now fit and healthy, that I feel good and my leg doesn't give me any problems. Question: How is your match fitness? Weigl: Since I've never been so badly injured before, I can only say it's not perfect! I definitely feel good, though. The nearly 30 minutes I played against Cologne were absolutely fine. I could have played a bit more. No we just have to see how it goes. Question: Is the injury still in the back of your mind? Or has your confidence in your body already completely returned? 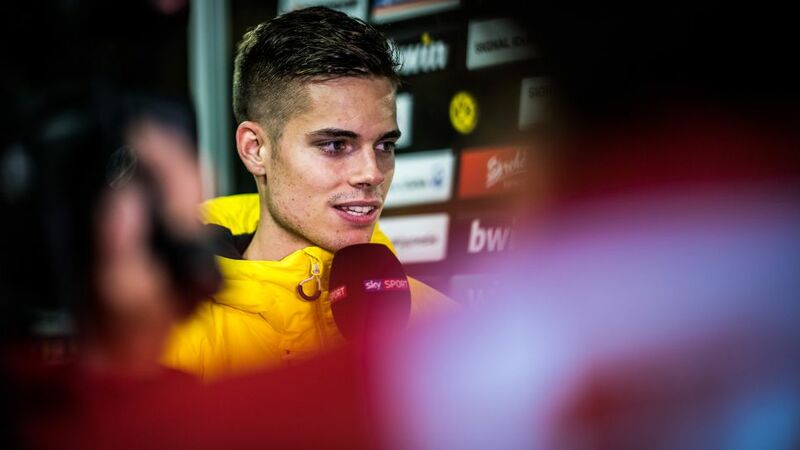 Weigl: I've felt clear of it for a couple of weeks, but it was still in the back of my head and meant I maybe held something back in challenges That's why it helped playing with the Under-23s in the regional leagues. I took a knock on exactly the same ankle and was frightened at first, but I also noticed that it didn't hurt any more. That moment made me calm about the injury. Since then I've noticed that my ankle is holding up. Question: Dortmund's style has changed under Bosz. Have you been able to absorb how he wants the team to play or is something missing having not been there for pre-season? Weigl: The good thing is that despite my injury I was at almost every team meeting. We always planned my rehab so that I could participate in team discussions. I think I already understand the way we're playing. Of course it still happens that I have automatic reactions from the last two years. It will therefore take some time, but I think I've been able to internalise the new way of playing. Question: What exactly has changed for you under Bosz? Weigl: I'm supposed to line up higher, playing between the lines. We're most different when we don't have the ball. We push very high with six players attacking the ball. We want to start attacks from the front. This is new to me. But I'm looking forward to working like this. Perhaps I can score or assist more. Question: BVB are top of the table after four games with 10 points and no goals conceded. Is the mood in the team upbeat? Weigl: The mood is very good, of course. We see that the system is working more and more. We know that we can always play dominant football, that our pressing works and that we're good at the back. Against Tottenham in London we scored and lost [BVB were beat 3-1 in the UEFA Champions League on Wednesday], but we didn't play a defensive game. The most important thing is that we have confidence in the coach's system and philosophy. It's been backed up by our results. The fact we haven't conceded in the Bundesliga is great. We always know we can score, which is very reassuring. Question: How do you think the season will go for BVB? Weigl: It is still too early to predict. We're very pleased to have started so well. Now, of course, we go to Hamburg with the aim to win, and that would keep us top for consecutive weeks again.